The Danjiangkou dam in central China’s Hubei province was raised to increase the size of the adjacent reservoir, and aims to provide water from central regions of China to Beijing in one of the most ambitious engineering projects in Chinese history. Can the South-North Water Transfer Project and Industry Co-Exist? By Huw Pohlner, a recent graduate of Oxford University’s MPhil in Geography and the Environment. This article was first published by chinadialogue. Sixty-two years after Chairman Mao first envisioned the South-North Water Transfer project, the Middle Route (SNWT-MR) formally began transferring supplies of water from Danjiangkou reservoir on the border of Hubei and Henan in December 2014. In the first phase of its operations, the SNWT-MR is expected to transfer an average of 9.5 billion cubic metres of water annually to Henan, Hebei, Tianjin, and Beijing for use by up to 50 million people. The SNWT megaproject is often described as consisting of “four horizontals and three verticals”: the canals of the Eastern, Middle, and Western routes connect the basins of the Yangtze, Yellow, Huai, and Hai rivers to help alleviate water scarcity in China’s parched northern cities. 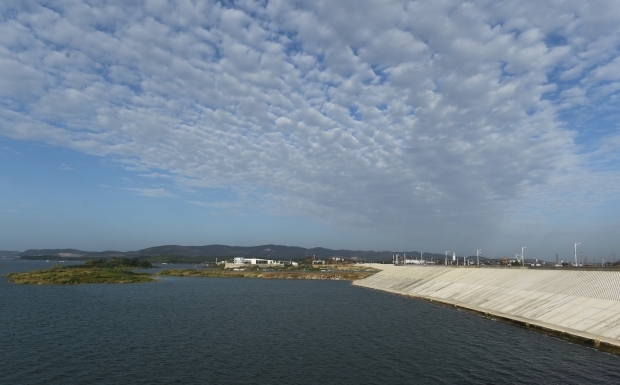 Central and local governments have pursued many different strategies to guarantee water quality in the Danjiangkou reservoir catchment. Governance of the project, which spans multiple river basins and a handful of provinces, is complicated by Danjiangkou’s catchment area, which encompasses 95,000 square kilometers of land administered by three different provinces: Hubei, Henan, and Shaanxi. Among the strategies for maintaining high water quality in Danjiangkou, the one that has perhaps attracted most attention—and ire—is the decision to ban two entire industries in the catchment: cage aquaculture and turmeric processing. Over the course of the SNWT-MR’s construction, one county in Hubei—Yunxi—saw its core industry eliminated and rebranded “the king of wastewater.” Hundreds of thousands of individual lives, from turmeric farmers to processing-factory workers, have been affected. In cage aquaculture, the transition has been similarly devastating to a key local industry: over 200,000 cages are slated for removal from the reservoir by the end of 2015. Factory closures and cage removal has affected government tax revenues too, especially in counties where economic reliance on turmeric or cage aquaculture was high. It is too early to say for sure whether industry bans have improved or at least stabilized water quality in Danjiangkou reservoir, but before the restrictions were imposed total nitrogen had increased from 0.62mg/L to 1.55mg/L and total phosphorus from 0.005mg/L to 0.02mg/L between 2006 and 2014, according to local government sources. In addition to bans on certain industries, attention to other sources of agricultural and industrial runoff, and improved treatment of domestic wastewater, are critically important. In light of the release of the Water Pollution Prevention and Control Action Plan earlier this year, which singles out particular industries for national action, success at Danjiangkou will be an important early indicator of the viability of the government’s new tougher approach to water quality management. But catchment protection policies implemented in the Danjiangkou region also have the potential to achieve socioeconomic, as well as environmental and ecological, outcomes. Overall, Danjiangkou’s catchment is one of China’s poorer regions: 79 percent of the counties (34 out of 43) that make up the catchment are registered as “national poverty-stricken counties,” compared to 21 percent of all counties in mainland China. Like many watersheds in China and elsewhere in the world, the Danjiangkou area is home to a comparatively poor rural population in its upper reaches and a comparatively wealthy urban population around the reservoir. The majority of the indirect costs associated with catchment protection are likely to accrue in those poorer counties. China’s former “turmeric town,” Yunxi, had a GDP of just one-third of the average for its parent prefecture, Shiyan, in 2014. Careful management of watershed protection is required to prevent the costs of clean water from further disadvantaging upstream communities. The Danjiangkou case highlights the importance of appropriate and timely compensation for those individuals and families affected by bans on polluting industries implemented in pursuit of water quality protection. Best-practice protection in the Danjiangkou basin should aim to simultaneously protect local environments and reduce regional wealth and income inequalities, setting an example for the many catchment protection policies yet to be implemented across China. Helpfully, China already has a policy tool in place to reduce the costs to local communities of keeping catchments clean. “Ecological compensation” marries payments for ecosystem services (PES) with the “polluter pays” principle. Though not yet widely implemented, ecological compensation has been successfully trialled in several different environmental and economic settings and contains the key elements necessary for reducing the indirect costs of protection to vulnerable upstream communities. Implementing fair and effective ecological compensation is ultimately in the interests of the ruling Chinese Communist Party, the legitimacy of which is increasingly linked to performance in the areas of environmental protection and social justice. The Danjiangkou catchment and the SNWT project are important testing grounds for mitigation of the costs of clean water in China.